This Collection concerns, almost exclusively, two three-month visits to India in the winters of 1922/33 and 1925 by Sir Francis Charles Oppenheimer KCMG, FO hereafter [1870-1961: ODNB]. FO was at Balliol in 1890-1893; he was called to the Bar in 1895 but spent most of 1897-1900 in Paris as an artist, after which he was a diplomat 1900-1920 [retiring KCMG 1919]. He was a bachelor until he married Lady Jane Horlick [née Martin] in 1931. FO’s autobiography A Stranger within  and his ODNB entry are useful for background and sources about his life up to 1920 but neither mentions his trips to India. He died in 1961. FO’s visits to India were made as guest of the Viceroy, Rufus Isaacs [1860-1935, Viceroy of India 1921-1925, Lord Reading 1914: ODNB]. He had served his bar pupillage with Isaacs, and enjoyed intimate friendship with him and his first wife Alice (d.1930) , who “became a beloved sister whose affection enriched my life as long as she lived “. He was a high profile member of the Viceroy’s inner circle throughout both visits, and attended most state occasions with him, but he made a number of private journeys of a few days away from the Court - more in 1925 than in 1923. He also made a relatively short and essentially private visit to India in 1927, for which there is a very small amount of material in the Collection. FO himself began arranging the present Collection towards the end of his life, with the intention of giving it to the College, but he died before completing his task; it was passed to the College by his widow as he had left it in 1962. On receipt in 1962, the Collection comprised five bundles, two framed photographs, and a box of loose photographs and mixed papers. Rachel Kemsley made a preliminary note in 1995, based on brief examination by Vincent Quinn in 1962, and the Collection is cited in the ODNB, but when examined in 2010 it was still entirely unprocessed, in soiled envelopes, disordered within FO’s bundles, and replete with rusty paper clips. It has now been cleaned up, further sorted within FO’s bundles, repacked and described, but the general arrangement established by FO has been preserved, despite the fragmentation that entailed. In section and subsection headings A-E below, any characterisation in ”quotation marks“ is FO’s. Sections A-E were his five partially sorted bundles, which had been so designated by him; the remainder is described under section headings F and G; subsectioning as convenient has been introduced throughout. All of the letters, except where otherwise indicated in a small number of cases, were addressed to FO himself. Many of the subsections contain printed ephemera, letters and notes etc, concerning official Viceregal visits in which FO was a leading participant. Typically the ephemera comprise elaborately printed timetables for special Viceregal trains, overall programmes, dinner menus, seating plans, lists of those involved, arrangements for shooting parties, etc. On these visits FO was accorded attention and hospitality by the Indian rulers visited. The long and detailed letters FO wrote home in 1923 [B.4] were in lieu of a diary, and give complete coverage of his first visit. He kept a diary on loose sheets throughout his second visit in 1925, which is also practically complete, but which he divided between material covering his experiences in Delhi [in C.1] and material covering visits away from Delhi [in C.5-8]. Although his diary frequently mentions time spent sketching and painting, there is no artwork in the Collection. In his diary and letters, FO uses “H.E.” or “H.X.” for the Viceroy or Vicereine and “T.Es” or “T.Xs” for them together: in the list below they are alluded to as the Viceroy and Lady Reading respectively. Born in London 17 December 1870; son of Sir Charles Oppenheimer, Knight, Consul-General of Frankfurt. Educated : Lycée, Frankfurt; Balliol 1890-4 (tutor: Sir Thomas Raleigh); 2nd in Jurisprudence, and B.A., 1893; M.A. 1898. Married 1931 Jane, Lady Horlick, daughter of Colonel Cuncliffe Martin. Called to the Bar in January 1895, but in 1897 abandoned the law to study painting in Paris, which he did until the death of his father in 1900 called him away to other things. Consul-General for Frankfurt, Hesse, and Hesse-Nassau, 1900-12. Attended White Slave Traffic Congress 1902; British Delegate to International Life-Saving Congress 1908, Frankfurt. Appointed Commercial Attaché to Embassy at Berlin, and to the Northern Legations, with the personal rank of Acting Councillor of Embassy in the Diplomatic Service, 1912. In the Hague, 1914, he negotiated the neutral trade agreements resulting in the Netherlands Overseas Trust (the first of the private bodies constituted in neutral countries in connection with the blockade); and the Societé Suisse de Surveillance Economique 1915 (a similar mission). Special mission to Vienna as British Financial Commissioner 1919. Retired from Diplomatic Service 1920. 1923 and 1925: paid prolonged visits to India, spending three months each time at the Viceregal lodge as the guest of the Viceroy (Lord Reading - Rufus Isaacs, Marquis of Reading, 1860-1935; see the D.N.B.) and his wife, who were old friends of Oppenheimer's. The papers held by Balliol relate to these visits to India. Provenance : The papers were offered to Balliol by Sir Francis Oppenheimer in 1961, motivated in part by an awareness of Balliol's past links with the Indian Empire; they came to the College via his wife in 1962, after her husband's death. See Balliol College Registers 1832-1914, 1833-1933, 1900-50, 1916-67.
Who Was Who 1961-70 . - the list is in the hand of EV Quinn, College Librarian, but appears to be a copy of Oppenheimer's own labels. F. Box album & snapshots, etc. A. ”Letters from Lord and Lady Reading in India, & from some of their staff, while I was in India “. Oppenheimer A.01. 3 Christmas cards: from the Viceroy 1923 and [1925, with envelope], unsigned; and from the Viceregal Lodge, signed illegibly 1924. Oppenheimer A.02.11. Letter of thanks from Marjorie Hambro [wife of Sir Percy Hambro: Christmas guests of the Viceroy]. Oppenheimer A.03. Correspondence from the Viceroy. Oppenheimer A.03.01.ALS from the Viceroy [signing “Rufus” and opening “Dear Frank”], in original envelope, 18 November 1925. Addressed to FO at 4 Chelsea Manor Studios, Flood Street, Chelsea. Oppenheimer A.03.02. ALS from the Viceroy [signing “Rufus” and opening “Dear Frank”], in original envelope, 16 February 1926, mainly about the proposal for a statue by a sculptor called Walker who was proving difficult. Addressed to FO at 4 Chelsea Manor Studios, Flood Street, Chelsea. Oppenheimer A.03.03. Sealed empty envelope contained in another sealed empty envelope, reinforced for registered postage, ND. postmarks illegible. The inner envelope was addressed in autograph by the Viceroy “Private and Personal”, to FO at Maiden’s Hotel Delhi. Oppenheimer A.04. Correspondence from Lady Reading (Alice Edith, nee Cohen, wife of the Viceroy). 29 ALS, 1 TLS substantial letters opening “Dear Frank”, most in their envelopes, a dozen brief notes and a telegram. 1922-1925. 44 items. Undated items are not sorted. OppenheimerA.04.01. 03 March 1923. 1l. OppenheimerA.04.02. 16 March 1923. 1l. OppenheimerA.04.03. 22 April . 1l. with envelope. OppenheimerA.04.04. 27 April . 2l. with envelope. OppenheimerA.04.05. 09 May 1923. 1l. with envelope. OppenheimerA.04.06. 07 June 1923. 1l. with envelope. OppenheimerA.04.07. 21 June . 3l. with envelope and enclosed b/w photograph of hunting trophies spread out on a table in a garden, including prepared tiger skins, an Asian black bear skin, and mounted antelope heads. OppenheimerA.04.08. 04 August . 2l. with envelope. OppenheimerA.04.09. 06 Sept . 2l with envelope. OppenheimerA.04.10. 02 Nov . 4l. with envelope. Oppenheimer A.05. Copied formal correspondence between GP de la Hay [PA to the Viceroy’s Military Secretary], and RW Egan [Station Superintendant, Delhi] 28 March 1923, concerning a first-class train booking from Delhi to Colaba on 12 April 1923 for FO, “guest of Their Excellencies”. Oppenheimer A.07. 2 former labels to FO’s Bundle A, written in his hand. B. ”Various letters connected with my visit to India”. Material concerning both of FO’s long visits, 1923 and 1925. Oppenheimer B.01. Two ALS from Sir Aurel Stein [explorer and archaeologist of North India etc: ODNB] 21 July 1925 and 19 June 1934, and one TLS 15 July 1929, all written from Oxford. Oppenheimer B.02. From the Maharaja of Alwar: two TLS [from Alwar March 1923; from London June 1923], one ALS signed Jey Singh [from Paris dated 13 Sept, but envelope postmarked 14 November 1923], and a Farewell Dinner [at the Cecil Hotel, presumably London] invitation 10 November [presumably 1923]. Oppenheimer B.03. 1 TLS from the Nawab of Rampur, 1925, and a New Year’s Card, 1926; and two ALS signed “Abdussamad Khan” [sometime Chief Minister of Rampur] 18 February 1923 and 26 March 1925. B.04.01. 28 December 1922, illegible signature, from Schloss Witaschütz, Provinz Posen. Opens “Dear Frank”. B.04.02. January 1923, Rachel Ezra [née Sassoon], from 3 Kyd Street, Calcutta. B.04.03. 7 January 1923, T Robbins, from the Grand Hotel. Written on an ALS to Robbins from FO of the same date on Viceroy’s Camp notepaper. B.04.04.a-b 7 January 1923 and 7 January 1925, JJ Godfrey (a [railway engineer], from the Bengal Club Calcutta. B.04.05. 15 January 1923, Ma..ie de Berch.., from [indicated in autograph] the “Palais Provincial” , opening “my Dear Friend” on blue notepaper with heraldry: a chequy shield with a dove bearing an olive branch in chief, a coronet above, griffin and lion rampant supporters and motto below ENDURER POUR DUR.. . Belgian postage stamp on the envelope. B.04.06. 17 January 1923, Alessandra Hailey [Lady Hailey, wife of Sir Malcolm Hailey] from Racquet Court house, Delhi. B.04.07.a-b 18 January 1923 [twice], Beatrice Blackett [Lady Blackett, wife of Sir Basil Blackett], from 34 Alipur Road. B.04.08. January 1923, John Worgan, from Viceregal Lodge, Delhi. B.04.09. 20 January 1923, Mrs Jacob D Jais of 325 West End Avenue [New York], from Hotel Cecil, Delhi. She had met FO on the SS Macedonia, and was soliciting an introduction to the Viceroy. B.04.10. 21 January 1923, Jean Inchcape [Lady Inchcape, wife of Lord Inchcape], from 1 Underhill Lane, Delhi. B.04.11. 27 January 1923, P Jacob, from 10 Probyn Road. B.04.12.a-b 2 February 1923 and 14 March 1925, Violet Haig [wife of HG Haig, later Sir Harry Haig], from 8 Cavalry Lines Delhi. B.04.13. 19 March 1923, TLS, Lord Inchcape, from 1 Underhill Lane Delhi. Concerning shrubs FO was sending to England. B.04.14. 21 March 1923, WE Gladstone Solomon, from the School of Art Bungalow, Bombay. B.04.15. 6 April 1923, Yvonne Fitzroy from Simla, on Viceroy’s Camp notepaper. With news of Lady Reading who is unwell, probably with sandfly fever, but who sends her love. The Viceroy “has shot 2 tigers and is even now pursuing a third”. B.04.16. 6 April 1923, Olwen Carey-Evans [daughter of David Lloyd-George and wife of TJ Carey-Evans], from Viceregal Lodge Simla. She has heard from her husband, who is at Gwalior, about an exciting accident involving an elephant which went mad when they were out on a tiger shoot. B.04.17. 7 April 1923, Captain Ralph Burton [an ADC] from Shivapuri [Shivpuri, Gwalior] on Viceroy’s Camp notepaper. ”Isnt it splendid H.E. getting 2 tigers & he got one stone dead with one shot which is his real first”. B.04.18. 7 April 1923, HG Gregory Smith [an ADC], from Gwalior on Viceroy’s Camp notepaper. The Viceroy is in great form: ”Shoots practically all day”. B.04.19. 10 April 1923, Frederick Henry Andrews, from 12 Queens Way, Raisina, Delhi. B.04.20. 14 May 1923, Sir Geoffrey F de Montmorentcy, from Observatory House Simla, addressed to FO at 4 Chelsea Manor Studios, Flood Street, Chelsea. ” I hate Simla as a bureaucratic Surbiton”. Lady Reading is almost herself again after her sandfly fever. The Viceroy “enjoyed Sipri [Gwalior] & his six tigers”…….”The Moderates are making a great fuss about certification in the constitutional point. There is fortunately as I predicted no opposition to the salt tax on economic grounds, the aspect of the case which had troubled H.E. most.” Sister Meikle has lost both her parents within a week; the problems of the Alliance Bank; two French Cruisers are due in Bombay on 31 May. B.04.21. 8 August 1923, TJ Carey-Evans [Viceroy’s doctor, later Sir Thomas Carey-Evans], from Viceregal Lodge Simla. B.04.22. 25 August 1923, HG Gregory Smith, from Viceregal Lodge Simla. B.04.23. 13 Nov 1924, Kroda Bose …., from Viceroy’s Camp Delhi, semi-literate. The writer is a bearer who has been engaged for FO. With an undated note from WW Muir about pay etc. B.04.24. 29 December 1924, WW Muir from the Office of the Comptroller of the Viceregal Household, setting out arrangements for FO to travel by train from Bombay to Calcutta, leaving 2 January. B.04.25.a-b. 2 and 4 January 1925, illegible signature possibly Mary, from the Taj Mahal Hotel Bombay; passionate letters of infatuation.The writer was possibly the Miss S with whom FO drove out of Bombay and sat by the sea on 2 January – diary, C.i]. B.04.26.a-b. 5 and 12 January 1925, Ada Wood, on notepaper of The Residency Srinagar Kashmir, that address deleted and “Sialkot The Panjab” written in its place. B.04.27. 7 January 1925, Maurice Oppenheimer from PO Box 82 Rangoon, on monogrammed notepaper, opening “ My Dear Frank”, hoping FO will visit Burma. B.04.28. 21 January 1925, Sir William Marris [Governor of Agra and Oudh], from Governer’s Camp United Provinces. B.04.29. 24 January 1925, illegible signature [perhaps R Seth] from illegible place. The writer is “off for good on the 18th February”. B.04.30. 2 February and 12 March 1925, Colonel Rivers B Worgan [Military Secretary to the Viceroy], from Viceregal Lodge Delhi. B.04.31. 10 March 1925, JW Turney, from the Grand Hotel Calcutta. B.04.32. 27 April 1925, TLS, Paul D Cravath, from 52 William Street New York New York: Cravath, with Harrison Williams had returned to New York after sharing “adventures and perils” with Sir Francis, and had also been Viceregal guests. Oppenheimer B.05. The label to FO’s Bundle B, written in his hand. C. Material re FO’s second trip to India, 1925. Oppenheimer C.01. Material concerning FO’s activities largely at Delhi and Calcutta. C.01.01. P&O Passenger List for the SS Narkunda [leaving London 12 December 1924] on which FO travelled to Bombay. C.01.02. Diary from 27 December 1924 to 17 March 1925, with gaps during visits away from base; diary sheets for such visits were filed by FO with other papers concerning them. Among much detail is a note dated 27 January 1925: “Mosley has seen Ghandi - childish ideas–good man–but no leader”. Oswald Mosley and his wife Lady Cynthia [GN Curzon’s daughter] were the Viceroy’s guests at the time. C.01.03. Lists and seating plans: lunch Belvedere 5 January 1925 [although FO was still in transit from Bombay, arriving Calcutta at 6am 7 January 1925] and dinner Viceregal Lodge Delhi on nine dates 15 January 1924-20 March 1924. C.01.04. A Viceregal Lodge Delhi dance booking card with pencil attached, unused, 19 January 1925. C.01.05. Cinema programmes Viceregal Lodge Delhi 16 January, 12 February and 3 March 1925. C.01.06. Eastern Command Review Programme [of music], Delhi 21 January 1925. C.01.07. A telegram 5 January 1925 from Harcourt Butler [Sir Spencer Harcourt Butler, Governor of Burma, a Balliol contemporary of FO’s] regretting that FO cannot visit Burma. C.01.08. Grand Military Searchlight Tattoo programme, Delhi 19 20 and 21 February 1925. C.01.09. An extract from The Pioneer 21 January 1925 with a detailed report on Royal Artillery exercises, Delhi 19 January 1925. C.01.10. An extract from The Pioneer 22 January 1925 with a detailed report on the State Opening of the Indian Legislature. C.01.11. FO’s Viceregal Lodge Delhi Bridge Accounts, January and March 1925. C.01.12. Speeches made by Sir William Marris 8 and 9 January 1925. C.01.13. Programme for a Viceregal visit [annotated “cancelled”; actually only postponed] to Gwalior and Aligarh 23-26 January 1925. C.01.14. Radh Mohan Polo Tournament programme 1925. C.01.15. Invitations from Lord and Lady Rawlinson and Sir Narasimha Sarma. C.01.16. Belvedere Post Office card setting out hours of business, times of delivery and dispatch etc. C.01.17. A printed petition left at FO’s door, from His Highness the Maharaj Adhiraji General Arjan Singh Sahib Bahadur Dhanjal Ramgarhia Singh seeking control over five Tehsils of Ramgarth State. C.01.18. Handbills from Dr GSD Sharman [probably a quack] advertising strange medical remedies . C.01.19. East Indian Railway timetable, special train for the Viceroy, Howrah to Delhi [946 miles] 8-10 January 1925. C.01.20. Offprint, “Life and its Mechanism.” Modern Review, December 1924, an address By Sir JC Bose FRS at the Bose Institute Calcutta, with a message from Bose inviting FO to the Institute, and a printed Convocation Address at Patna University, nd, anonymous but presumably by Bose. Oppenheimer C.02. Printed daily Viceregal engagement sheets January-April 1925, giving details of all engagements, comings and goings of guests and senior staff. 62 separate leaves in date order, printed both sides. Oppenheimer C.03. "Journeys 1925”. Detailed itineraries travel arrangements etc, including letters from senior officials at Lahore Lucknow and Peshawar, correspondence with DB Parasinis about a visit to Satara, an exchange with the Maharaja of Benares about a visit there, and the P&O passenger list for the SS Razmak leaving Bombay 10 April 1925. Oppenheimer C.04. Ephemera etc for the Viceregal visit to The Muslim University Aligarh 26 Jan 1925. With a copy of the speech of Her Highness Nawab Sultan Jahan Begum, Ruler of Bhopal and Chancellor of the University, and a pamphlet giving the Vice Chancellor’s Address on behalf of the University Court, outlining the history and ethos of the University [15pp soft cover,1925]. See F.i.1. Oppenheimer C.05. FO’s visit to Ajanta and Ellora Caves 20 March 1925; an independent trip with arrangements facilitated by the Nizam of Hyderabad. With FO’s detailed notes and his report to A Hydari, Hyderabad Minister of Finance, with advice on publication of the paintings etc, and other correspondence with the same. See F.01.13. Oppenheimer C.06. Ephemera etc for the Viceregal visit to Gajner [Bikaner] 6-9 Feb 1925, with diary for the weekend. Hundreds of birds were shot. Oppenheimer C.07. Ephemera etc for the Viceregal visit to Gwalior 13-16 Feb 1925, with diary. The programme included a successful tiger shoot with elephants. Also a copy of Gwalior Fort Album, 2nd edn, paper covers, 58pp, illustrated, pub. Archaeological Dept Gwalior State. C.08.01. “Rampur Feb 6-10th 1925”. With diary, which indicates that in fact this visit took place 6-10 March 1925, begun on Rampur Palace notepaper. C.08.02. “Peshawar Feb 21-25th 1925”. With diary on Government House Peshawar notepaper recording a visit to the Khyber Pass, and including an ALS from Marjorie Jardine, 4 Fort Road Peshawar, 25 February 1925. C.08.03. “Lahore Feb 26-27th 1925” A visit to Sir Malcolm Hailey, Governor of the Punjab, at Government House; with diary. C.08.04. “Alwar March 1st–3rd 1925”. With diary. FO was entertained by the Maharaja of Alwar, Jai Singh, from whom there is a TLS after the visit pressing him to come again before leaving India, which he declined. In his notes FO recorded that he thought the Maharaja an eccentric man of whom servants were terrified, with an aversion to dogs, who was cruel to his horse. Oppenheimer C.09. The label to FO’s Bundle C written in his hand, on the back of a ts fragment of his draft autobiography. D.”Some Indian Tours”. This material all concerns FO’s first trip to India, 1923. Oppenheimer D.01. “My letters home [to Lucy] 1923”. Sixteen very long [typically 8-12 sides close-written] ALS by FO to England, 7 December 1922 to 1 March 1923. Lucy was the wife of FOs brother Albert Martin Oppenheimer, but not all the letters were addressed to her: one opens “Dear Evelyn” and several open “Dear Friend”. FO was explicit that these letters were written in lieu of a diary and asked for them to be shared and kept. They are rich in detail about the life of, personalities of, and events in the Viceregal Court December 1922-April 1923. Oppenheimer D.02. Ephemera etc for the Viceregal visit to Agra 2-4 March 1923. Oppenheimer D.03. Ephemera etc for the Viceregal visit to Kapurthala 10-11 March 1923. With a set of fifteen souvenir postcards of Kapurthala; also an ALS of 12 March 1923 from the Tika Rani Shahiba of Kapurthala [Princess Brinda], FO’s draft response and two complete [never sent] ALS by him to her during a visit by her and her husband to England in June 1923. See F.i.4. Oppenheimer D.04. Ephemera etc for the Viceregal visit to Bhopal 17-19 Feb 1923.The elaborate programme for the state banquet on 19 February 1923 includes photographs of the Viceroy and Lady Reading and their host the Nawab Begum of Bhopal. In his letter home of 25 February 1923 he described her as “…. the only lady ruler in India– a bigotted Mahamedan- but otherwise a wise, reforming sovereign of the Queen Victoria type”. Oppenheimer D.05. Ephemera etc for the Viceregal visit to Rampur 2-4 Feb 1923. Oppenheimer D.06. Ephemera etc for the Viceregal visit to Bharatpur 24-25 February 1923. Oppenheimer D.07.Ephemera etc for the Viceregal visit to Ajmer and Jodhpur 25-29 January 1923. With a copy of A short Account of Jhodphur. Its History and places of Interest: 25 pp, hard cover; fold-out map and genealogical table of rulers; biographical information about recent Maharajas including the then Maharaja, Captain Sir Umaid Singhji Sahab Bahadur KCVO. Oppenheimer D.08. Material from 1923, mostly concerning FO's activities in Delhi. D.08.01. A copy of Delhi Fort, A Guide to the Buildings and Gardens: Archaeological Survey of India, Calcutta 1919, 56pp card covers, with a pull-out plan. D.08.02 A printed Alphabetical List of Callers in Delhi 1922-23 (who have called at Viceregal Lodge up to the 19th February 1923) : sixty three foolscap pages, perfect bound with pale blue limp cover detailing over a thousand callers’ names, styles, addresses, posts held and calling dates. D.08.04 The Pioneer, Allahabad, 1 April 1923, a complete day’s issue, containing, inter alia, reports concerning the Salt Tax. D.08.05 The Pioneer 22 March 1923, pp3-4, with a detailed report on a banquet to Lord Inchcape, printing his speech following a summary of the Viceroy’s tribute to him and the Inchcape Committee. D.08.06 The agenda paper for the Legislative Assembly, 19 March 1923. Sir Basil Blackett to move that a Bill concerning, inter alia, the Salt Tax be considered and passed. D.08.07 Viceregal Court Engagements sheets 9 February 1923-March/April, blank from 20 March. D.08.08 East Indian Railway timetable, special train for the Viceroy and entourage, Howrah to Delhi [946 miles] 8-10 January 1923. Exactly the same journey was made by the Viceroy and entourage on exactly the same dates in 1925. D.08.09 A handbill “Musical Ride by XIth Hussars in Historical Uniform”, nd, npl. D.08.10 Postal Notice from the Viceroy’s Post Office Postmaster: the next outward foreign mail would be despatched from Delhi on 21 January 1923. D.08.11 FO’s pass to the gallery of the Council Chamber of Metcalfe House, Chamber of Princes [Narendar Mandal], February 1923. D.08.12 FO’s invitation from the Governing Body of the Lady Hardinge Medical College for Women Delhi, to the opening by Lady Reading of the Lady Reading Hostel, the new residence for the nursing staff. See F.i.8. D.08.13 Musical programme, Viceregal Lodge Delhi 16 January 1923 [Sgt Major WH Weston, Director of Music to the Viceroy]. D.08.14 Postcard, coloured, artist’s view of the Great Mosque Delhi. D.08.15 A dance booking card with pencil attached, Viceregal Lodge Delhi 23 February 1923. D.08.17 A concert programme, Viceregal Lodge Delhi 10 February 1923. D.08.18 A small personal card: Chunna Mal “Guide Tophole & OK “ Hotel Cecil Delhi. D.08.20 Viceroy and Lady Reading, or next but one if there was a VIP guest. D.08.21 A TS message, unsigned, from Frank CO Seaman, 15 March 1923, inviting FO to dine at the Hotel Cecil to meet HH of Morvi. Oppenheimer D.09. “Calcutta Dec 17 1922 to Jany 8 1923”. Material relating to the Viceregal Christmas party at Belvedere near Calcutta, and other activities. D.09.01. Viceregal Court engagements 17 December 1922-15 February 1923, in detail to begin with and in outline later. D.09.02. Belvedere Grounds and House: a foolscap booklet with detailed pull-out plans of the grounds and three floors of Belvedere House with room and tent assignments for the Viceregal party. D.09.03. Belvedere dinner lists and seating plans etc 19 December 1922-5 January 1923. D.09.04. Belvedere dance booking cards with pencils attached, unused, 26 December 1922 and 5 January 1923. D.09.05. Programmes for Madan Theatre Ltd entertainments Christmas Day [printed on a silk handkerchief] and 30 December 1922. D.09.07. A 1922-1923 season pass to Calcutta Racecourse Club Stand and Enclosure. D.09.08. P&O Passenger List for the SS Macedonia [leaving London 24 Nov 1922] on which FO travelled to Bombay. D.09.09. FO’s Viceregal Lodge Calcutta Bridge Account for the month. D.09.10. Invitations from the Countess of Lytton; Messers Abul Kasem and AFM Abdul Ali; and the Maharani Adhirani of Burdwan. D.09.11. Order of Service for the marriage of Mr CL Corfield and Miss Phyllys Betha Pugh in St Paul’s Cathedral Calcutta 22 December 1922, with an extract from The Statesman 23 December 1922 with photographs and full details of guests, presents etc. D.09.12. A brightly coloured print, A3 approx, showing a four armed deity with a bloody chopper in one hand and a severed head in another [icons for Kali]. Printed at the Chorebagan Art Studio. D.09.13. A notice announcing when the Overland Mail would next arrive. Oppenheimer D.10. The label to Bundle D written in FO’s hand, on the back of a fragment of his draft autobiography. E. “Envelope and Seal used by one of the Native Princes, to send his greetings to the Viceroy. Given to me by Lord Reading”. Oppenheimer E.01. 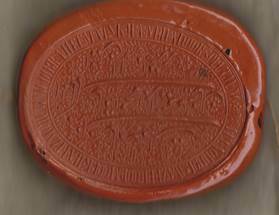 An excellent oval [axes 6x8cm] seal impression on a piece of hard red wax [modern type sealing wax], in its skippet, unidentified. Oppenheimer E.02. The bag for the seal (1 above), of some kind of gold [or substitute]-impregnated fabric in another bag of gauze . Oppenheimer E.03. The label to FO’s Bundle E, written in his hand. F.01.01. Three scenes, high quality, Viceregal visit to The Muslim University Aligarh. See C.iv. F.01.02. An unrecognised man in in topee poised with rifle at a shoot near Delhi. Duplicate prints, good quality A5 approx and snapshot. F.01.03. An unrecognised tall western woman emerging into the quadrangle of a palatial building, Jodhpur. A5 approx and snapshot, excellent quality. F.01.04. The Tika Rani and her three children, Karputhala. A5 approx and two small snapshots, fair quality. See D.iii. F.01.05 Miss Murphy at Purina Qila.Two different views A5 approx and a snapshot of one. Quality excellent. F.01.06. Sanchi. A6 approx. Quality fair. F.01.08. ”Lady Readings Hostel”. Three high quality 13x7.7cm prints. Lady Reading making a speech with the Viceroy seated beside her looking bored; a man responding; a line up of VIPs - perhaps the one with his hand on his hip is FO. See D.viii. F.01.09. Two good 14x8cm prints of the same ornate columns and steps, one of them showing a woman seated on the steps, annotated by FO “Pearl Mosque Delhi Miss Trotter taken by Captain Gregory Smith” and the other “Fort Pollac”. A Miss Helen Trotter appears in Viceregal dinner and engagement lists in 1923, associated with a Lady Henry. F.01.10. Eight high quality postcard views of the Khyber Pass and nearby, bought as a set from Mela Ra & Sons and snapshot of Mrs Jardine in a yard at Peshawar with camels. F.01.11. Snaphots taken at Rampur, quality good:four showing seated musicians; two showing the palace front and garden side respectively; one showing three women [identified as “Sister Meikle, …………., Miss Watson”], and one showing three men[identified as “McDull,Thompson, Librarian”]. F.01.12. Two small snapshots, quality fair, showing the SS Razmuk at Aden and a party at Aden with no identifications. F.01.13. Seven small snapshots from FO’s Ajanta visit. One, duplicated, shows Syed Ahmed [Caves Curator] and Captain WE Gladstone Solomon on the steps of the Nizam’s Guest House; another, also duplicated, shows Syed Ahmed with FO himself; the others show the entrance to one of the caves. See C.v.
F.01.14. About twenty good quality small snapshots and postcards showing scenes and buildings around Delhi. F.01.15. Three small high quality snapshots taken at Bharatpur. Carey–Evans with Gregory Smith in front of a grand house; the grand house; and FO himself seated in a one man punt in a bog being manouvered by two native servants knee deep in the mud. He was on his way to a duck shoot organised by the Maharaja; 720 birds of all varieties were shot that day, a relatively modest bag .The area is now bird sanctuary. F.01.16. A snapshot, quality fair showing Yvonne Fitzroy, Aurel Stein and Frederick H Andrews, dated Delhi Feb 1923. F.01.17. Six small snapshots quality good/fair, showing a Jain Procession, Delhi. F.01.18. Three small snapshots, quality fair, taken at Bhopal. One showing “H.E., Carey Evans and …… ” “going Tiger shooting”. F.01.19. About thirty small snapshots of little obvious interest, being indistinct or of unidentified scenes. Oppenheimer F.02. A small gathering of material regarding FO’s visit to India in 1927. F.02.01. TLS from Lord Inchcape, Glen Castle, 12 January 1927 telling FO he has noticed that he is to be a passenger on the SS Mongolia transhipping at Aden to the SS Razmak and has written to the Captains asking them to see to his comfort. Inchcape was Chairman of P& O.
F.02.02. Formal invitations for 6, 8, and 11 February 1927 from the Governor of Bombay and Lady Wilson, in their envelopes, addressed to FO at the School of Art Bungalow Bombay. F.02.03. TLS from Lord Inchcape 15 January 1927 addressed to FO at 4 Chelsea Manor Studios, Flood Street, Chelsea, enclosing a copy of a letter he has written to his partner in Bombay [Sir Leslie Hudson] about FO’s return journey. F.02.04. P&O Passenger List for the SS Rajputana, leaving Bombay 12 Feb 1927. Oppenheimer F.03. A photographically illustrated offprint, Fred H Andrews, “Central Asian Wall–Paintings”, Indian Art and Letters, 1934, VIII[NS], 1-21. Inscribed by the author to FO. This was a lecture delivered before the India Society on 11 July 1934, with an introduction by Sir Aurel Stein, presiding. Oppenheimer F.04. Two separate pages from FO’s draft autobiography. One refers in some detail to his un-named Tutor and family and the other to some political crisis requiring FO’s return to England and the efficacy of Mothersill, a seasickness remedy. Oppenheimer G.01. The Maharaja of Kapurthala. Signed and dated 10 March 1923, b/w photograph. The frame has rubbed Birmingham hallmarks for 1921. Oppenheimer G.02. The Nawab of Rampur. Signed and dated 1925, tinted b/w photograph. The silver frame is surmounted with the Rampur arms cast in relief and is hallmarked “H & Co Ld” “SILVER” with an elephant mark. The detached stand has a small inset ivory or ivorine circle with the legend “Hamilton & Co Ltd Silversmiths Calcutta Delhi and Simla”. -EV Quinn, ca 1962, Rachel Kemsley, 1995, add. & rev. JH Jones 2014.